Popular music tends to be divided into two kinds by intent: music that's fun, and music that's meant to be interesting and creative. Of course, it sometimes seems that what gets to the top of the charts ends up being neither. But when you have music that's particularly innovative or lyrically literate, it does tend to be more serious. While music that's good for a party is often a bit more on the simple side. This week's album is a pleasant mixture of both: while the emphasis is definitely on the fun, it is also stylistically eclectic with an intriguing blend of influences. It's the new second album by Paul Cebar and the Milwaukeeans, entitled Upstroke for the Downfolk. Two-and-a-half years ago, Cebar, with somewhat different personnel, released That Unhinged Thing, which was a rather wide-ranging blend that ran from Zydeco influence to R&B. This time, while there is a leftover accordion on a track or two, while the main sources of influence are Motown and Memphis soul, funk, Chicago blues and even a little rockabilly. But Cebar and band also draw on the kind of once-removed R&B sound of 60s bands like the Beatles and the Rascals. On top of that, they throw in some New Orleans gumbo and even a little African and Caribbean inspiration for a fun mix that's easy to dance to, while simultaneously featuring some slightly unconventional, often clever, lyrics. The result is an album that's good when you want to party, or when you want something refreshingly unlike commercial pop to listen to. Cebar is a veteran musician from, of all places, Milwaukee, who has worked both as a solo and with various groups. He has toured with Nick Lowe, opening as a solo act. And his Milwaukeeans band was featured last year on Public Radio's A Prairie Home Companion. For this album, guitarist Cebar is joined by the following reputed residents of Wisconsin's largest city, saxophonist Paul Scher, percussionist McKinley Perkins, drummer Randy Baugher, bassist Alan Anderson and guitarist Rob Gjersoe. Occasional additional horn players and keyboardists are brought in for some of the tracks, but the core band provides most of the sound. Cebar is a fairly interesting vocalist -- he draws on a lot of influences, especially from the R&B world, but he does not sound like anyone in particular. His singing works better in some situations than others -- he's usually best in the middle, on the bluesy, funky tunes. His performances on both the slower tunes and on the high-octane rockers are not as strong. Paul Cebar and the Milwaukeeans' new album Upstroke for the Downfolk is an intriguing admixture of influences from Motown to Memphis to Caribbean to African, along with often clever lyrics, and a spirit of good fun throughout. While there are other more fascinating blends of influences, and other more consistently full-tilt party albums, this release provides a relatively rare blend of danceability with intelligence. In the sonic department, the album is decent and has no real shortcomings, though neither is it likely to win an audiophile award. The main problem is a bit of inconsistency among songs especially in the lead vocals. A possible reason is that the album was recorded and mixed in two different studios. 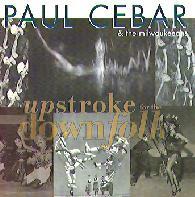 While this may not be the band that made Milwaukee famous -- the music is too eclectic to have much of a chance on the pop charts, Upstroke for the Downfolk by Paul Cebar and the Milwaukeeans does make for some enjoyable listening and dancing.